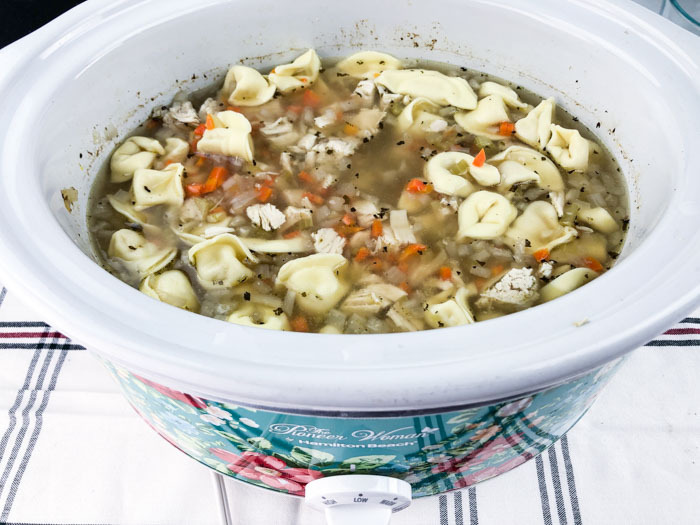 Disclosure: This Slow Cooker Chicken Tortellini Soup recipe was sponsored by T-Mobile. For these cold January days, soups are a favorite weeknight meal option for us. We can sometimes get stuck in a rut with the same old soups, so it helps to change it up and use a few ingredients we don’t normally see on the menu. 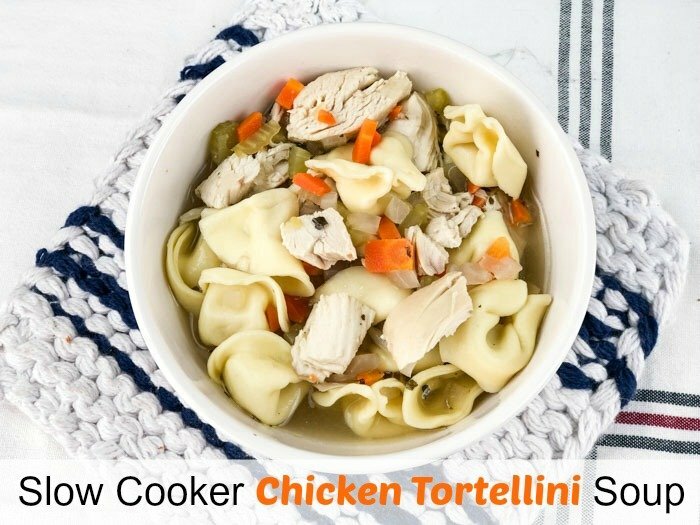 This Slow Cooker Chicken Tortellini Soup is a great hearty soup that works for a weeknight or even a lunch, with the tortellini pasta adding a fun surprising addition! 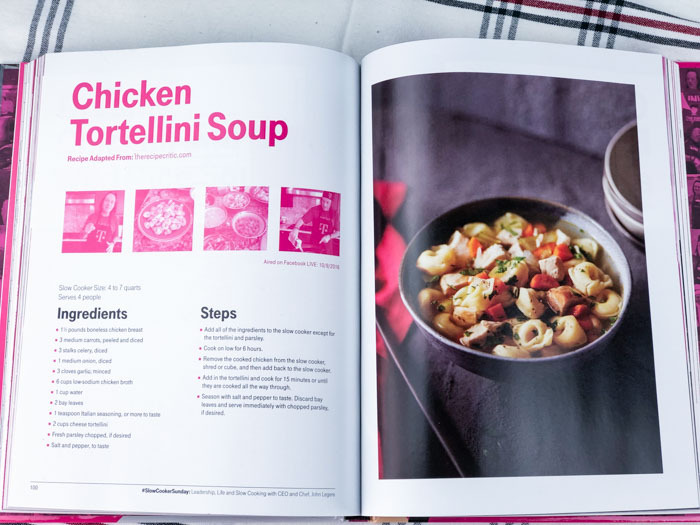 I got this recipe from T-Mobile’s new #SlowCookerSunday Cookbook. If you’re like me and just love your Slow Cooker, you need to check it out. 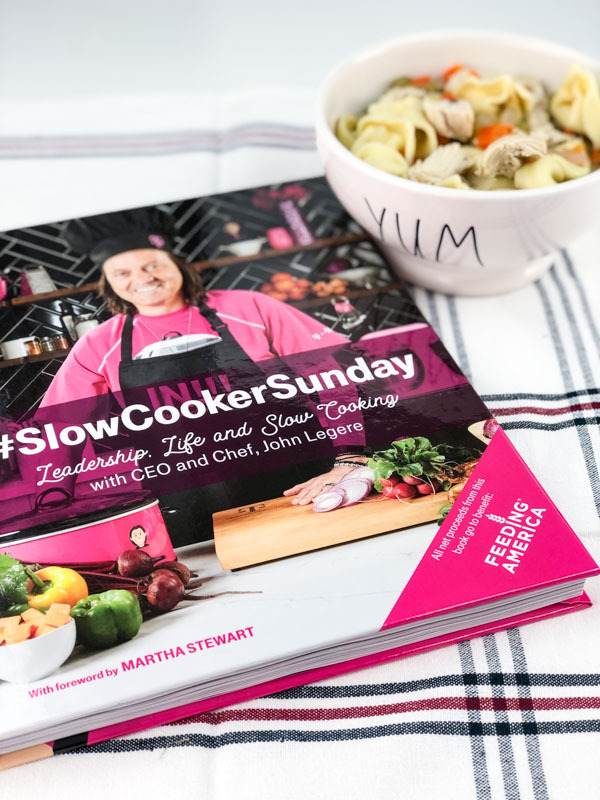 #SlowCookerSunday – Leadership, Life and Slow Cooking with T-Mobile CEO and Chef, John Legere is now available at T-Mobile.com and in T-Mobile stores. The book includes 52 of Legere’s favorite recipes, along with bits of advice. Net proceeds from the sales of the book will go to Feeding America to help feed America’s hungry. The ingredients for this soup are straightforward and stuff you will probably have in the pantry and fridge. Use fresh vegetables for the best flavor and health benefits, of course. For the spices, if you don’t have fresh herbs at your fingertips you can substitute dried spices where needed. 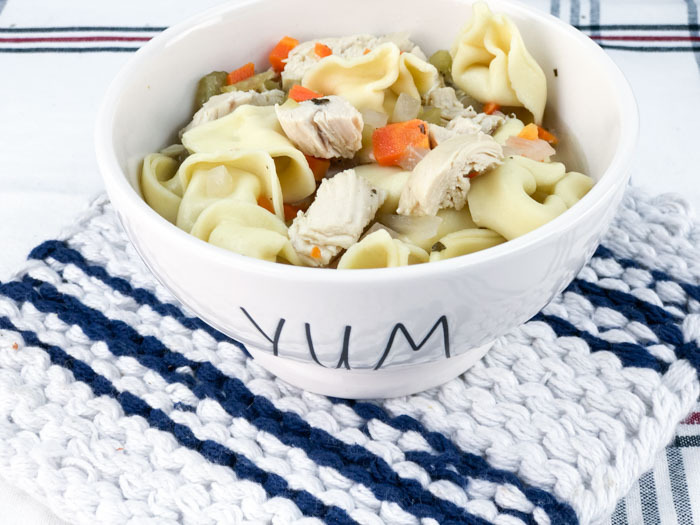 I also like the option of using low sodium chicken broth, since watching salt intake is a big concern for anyone looking to keep their recipes heart healthy. The ingredient that really makes this dish and takes the flavors to the next level is the cheese tortellini. It does not specify dried or fresh (refrigerated) tortellini, but I do try to get the refrigerated varieties if my grocery budget allows. They have such a good flavor and really do go a long way since they are going into the soup. Even for a hearty eaters like grown college kids, this soup is filling and won’t leave you wondering where the main dish is for dinner! Isn’t this soup gorgeous? I love the fresh veggies against the flavors of the cheese tortellini. It’s hard to keep from coming back for seconds! If you are thinking of what sides go with this dish, I sometimes serve it with homemade corn bread. Crusty garlic bread or rolls also work just fine, if you don’t have the ingredients or time for the corn bread. For a lighter meal option, serve this soup with a bowl of steamed broccoli, fruit cup, or a small salad. You will want to add this one to your winter meal rotation for sure! For this recipe and to purchase the #SlowCookerSunday Cookbook from T-Mobile, click here. I was excited to make this recipe but there are of course so many more that will be great for our main dish menu at home. Disclaimer: This post is sponsored by T-Mobile.